There are about 6,500 to 10,000 species of mostly multicellular, marine algae, including many well known seaweeds including over 160 freshwater species. Their red colour comes from the pigments called phycobiliproteins. Red algae range from microscopic forms to large fleshy algae. They are usually red but some species living high on the intertidal fringe may be olive-brown. 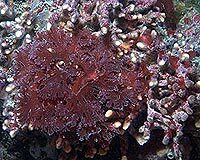 Red algae are found in all the regions of the world growing attached to the bottom or other hard surfaces. They are grazed by herbivores such as fish, crustaceans, worms and gastropods. Usually the red algae are slow growing compared to green algae and reproduce both asexually and sexually. They have some of the most complicated sexual cycles of any organisms. Most red algae store their sugars as glycogen. Glycogen is a long chain of glucose molecules with lots of side branches. It is very different from the starch that brown or green algae store. 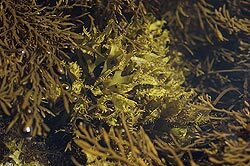 Besides having the usual cellulose cell walls that most algae have, Rhodophyta also have 3 important chemicals in their cell walls. These chemicals are agar, carrageenan and gelans (mucusy sugars). Some red algae, like the coralline algae, deposit calcium carbonate in their cell walls. This prevents them from being eaten and gives them strength and support. These algae make an important contribution to the growth of coral reefs. 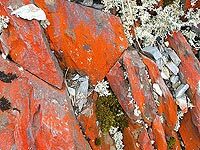 Some species of red algae can grow in a thin mat over rocks and other hard structures, and are called crustose when growing in this form. 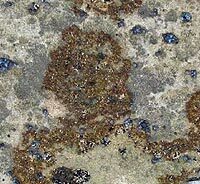 The upright coralline and crustose forms of red algae bind and infill coral skeletons to form massive sedimentary structures which are strong enough to resist wave-action and erosion. 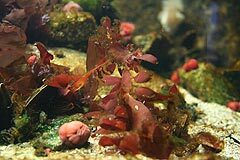 The sperm of red algae cannot swim and they rely on water currents to transport them to the female organs. They can have quite complex reproductive cycles involving alternation of generations. 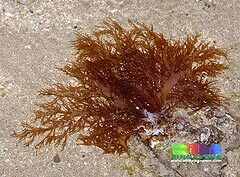 Several species are used as food including Palmaria palmata or dulse. It is a well-known snack food in Europe, and, in Iceland it has been an important source of fibre for many centuries. In Japan the cultivation of nori is a major industry employing over 300,000 people. 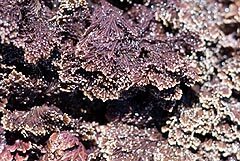 Red or crimson in colour, nori becomes dark or blackish when dried, and green when cooked. Nori is used to make sushi and added to soups, salads, appetizers and breads. 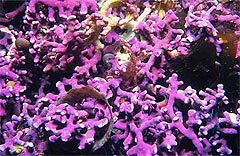 Coralline algae are Red algae. They have a hard thallus because of calcium carbonate deposits contained within the cell walls. The colors of these algae are usually pink, or some other shade of red, but some species can be purple, yellow, blue, white or grey-green. Most are encrusting and rock-like, found in marine waters all over the world from periodically-exposed intertidal settings to 270 m water depth (about the maximum penetration of light). They play an important role in the ecology of coral reefs. Sea urchins, parrot fish, molluscs (like limpets and chitons) feed on coralline algae and they provide microhabitats which offer protection to many young animals including sea urchins, chitons, and limpets. They are the most common red algae in coral reef environments forming hard crusts on the reef surface, cementing together coral and building the reef framework. 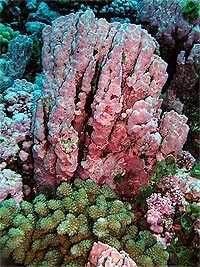 The coralline algae are particularly common in shaded areas or on the underside of coral rubble. Nongeniculate (nonarticulated) corallines - these have crusts ranging from a few micrometres to several centimetres thick . They are often very slow growing, and may occur on rock, coral skeletons, shells, other algae or seagrasses. .